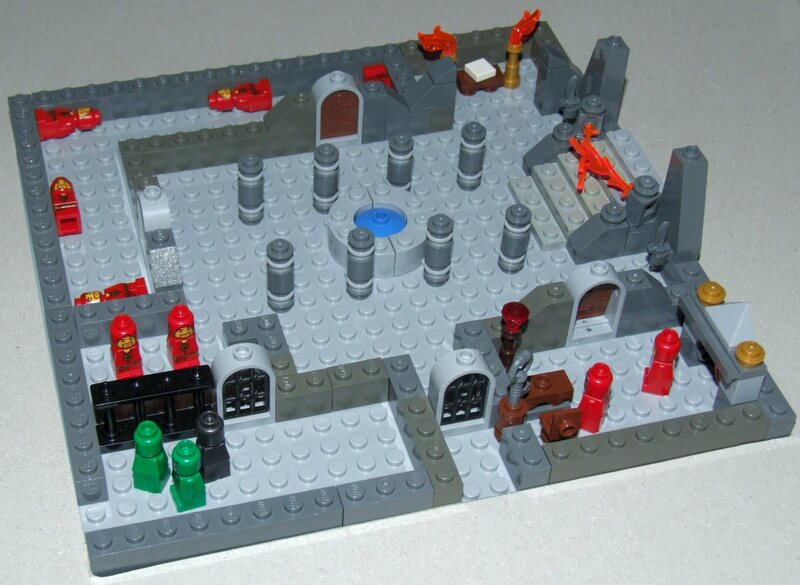 Following on from last week's Lego post here. I broke down my first creation (a goblin dungeon base) so that I could build an adjoining section. 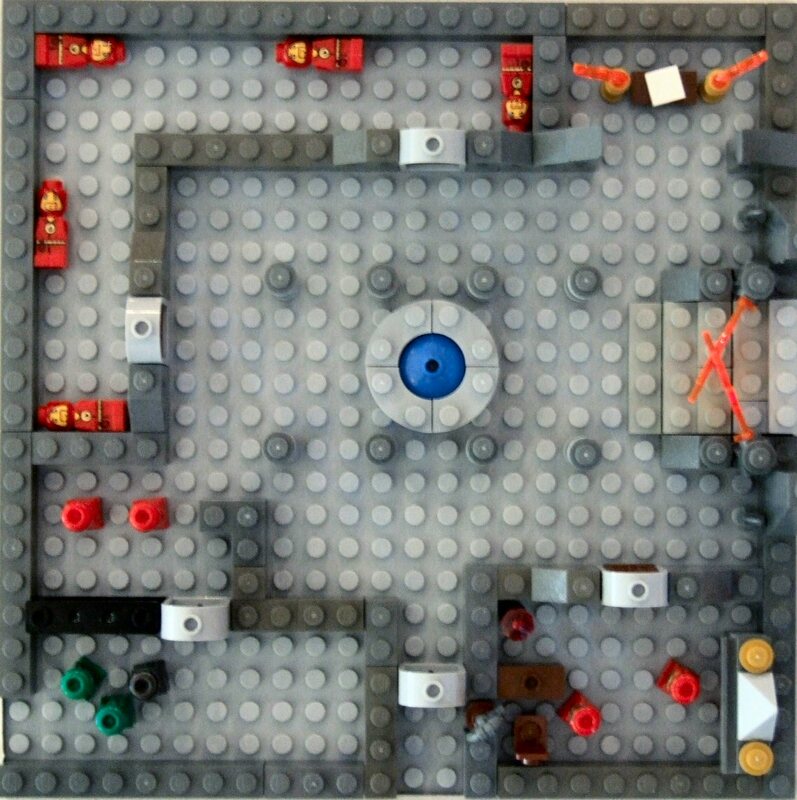 In this area a group of red-robed cultists reside. 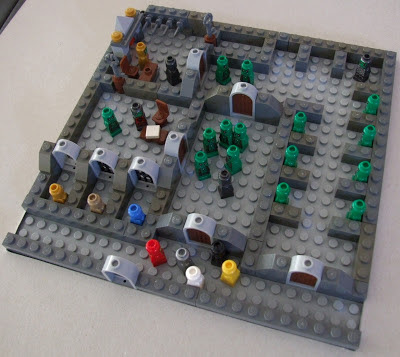 They buy prisoners from the goblins so they have a constant supply of victims for the.... well that will have to wait until the next section which the wide staircase leads to. 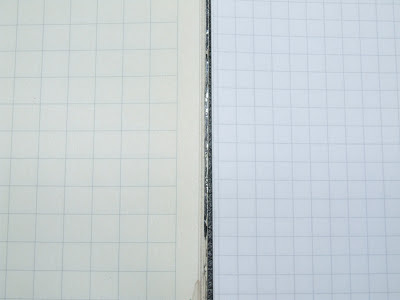 Tenkar posted about map making yesterday and I got thinking about the paper I use for maps. 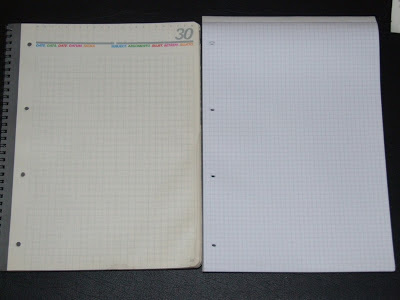 Nearly all my maps start on squared paper with a pencil. And nearly all of that paper has 5mm squares. 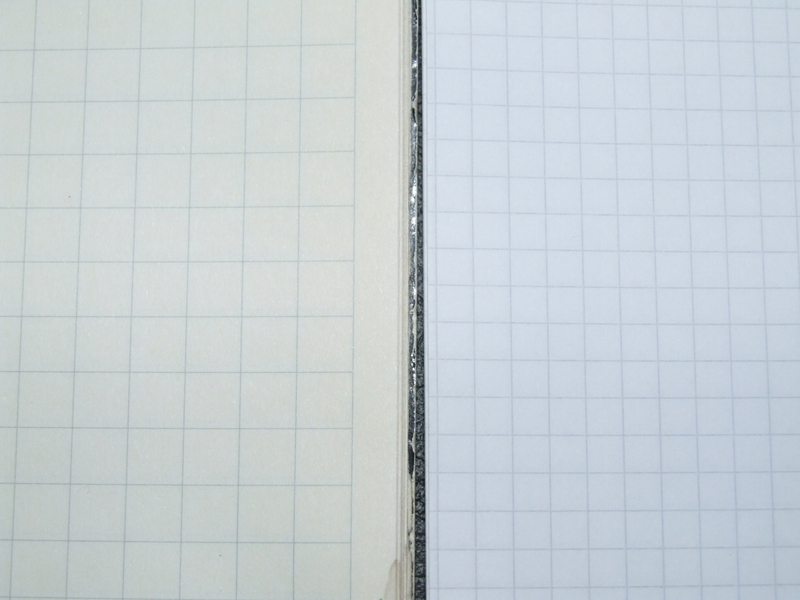 However, I have a few sheets left in pad with 7.5mm squares and I find that's the perfect grid for my drafts. I must have bought the pad years ago, and I wish I'd bought a dozen of them as 7.5mm doesn't seem to be a widely available size. I was tidying up our Lego Heroica sets last night when it crossed my mind that in a slightly different layout format the pieces could be used to create dungeons with a more traditional D&D look. Using a base board, the Heroica parts, and a pile of dark grey bricks from another Lego set, I set about making a small dungeon section. The scale is 1 stud to 5 feet so the section pictured represents 120'x120'. 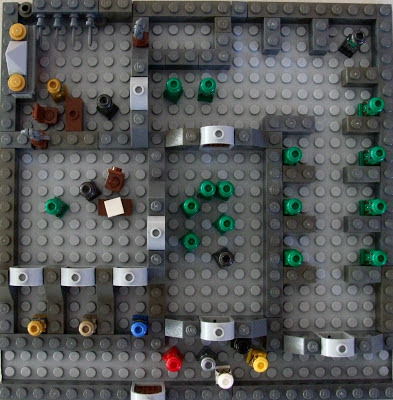 This is a great way to create map ideas as the design is far easier to adjust than a paper version. 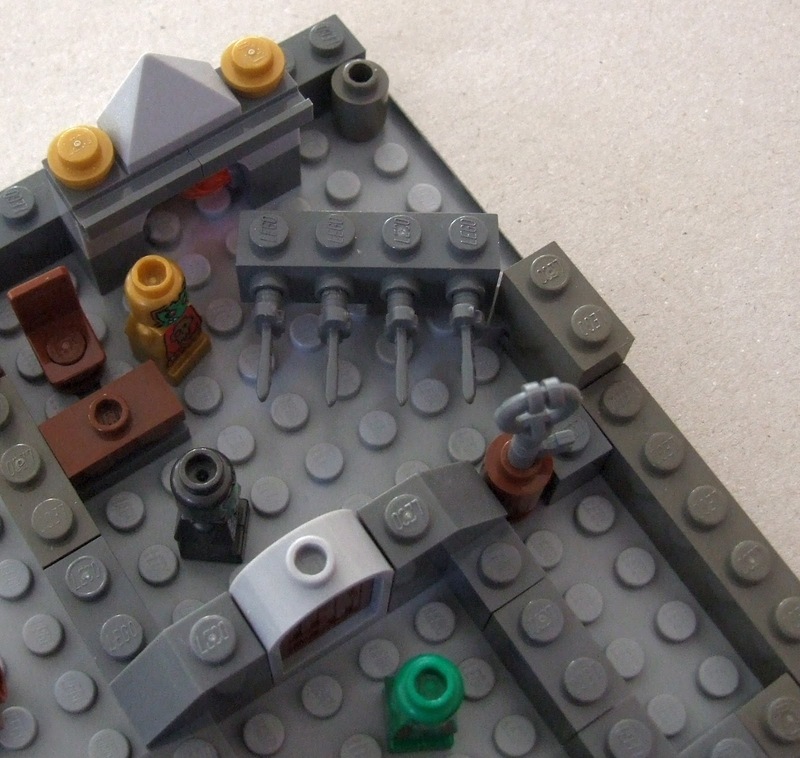 You can also add extra details (note the fireplace, table, chair, secret door, and the mean looking trap in the Goblin Chief's room). The photo taken directly over the model gives the appearance of a 2D geomorph. With several different sections designed and photographed they could easily be slotted together in Photoshop. Of course, an even better option would be to have lots of them made up at the same time, but that would take quite a lot of Lego. 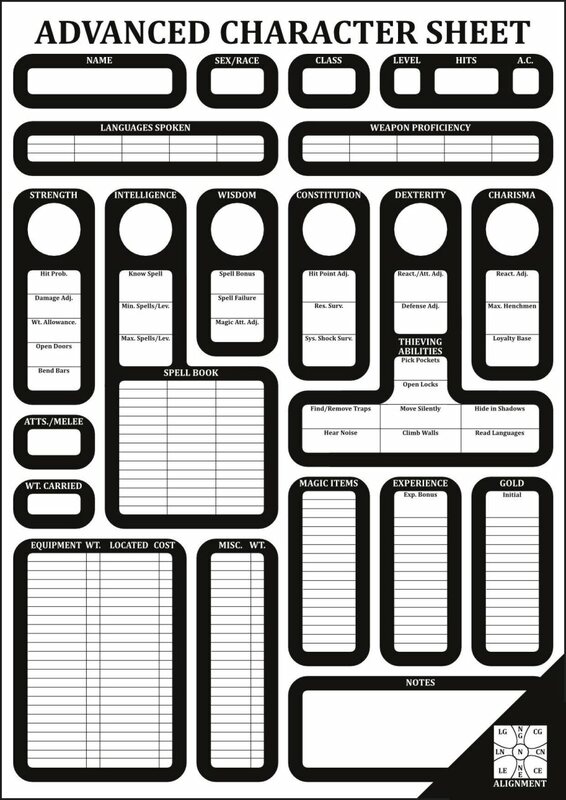 Our Character Sheet Pad is entering the final stretch on Kickstarter. With just 72 hours left to go it is at 90% of the goal. We only need 3 more backers and we'll be there. Since I made the PDF of the Character Sheet free to download, over 350 copies have been downloaded. Hopefully, many of those downloaders have visited the Kickstarter page and asked for a reminder email (Kickstarter normally sends these at the 48 hours to go point). 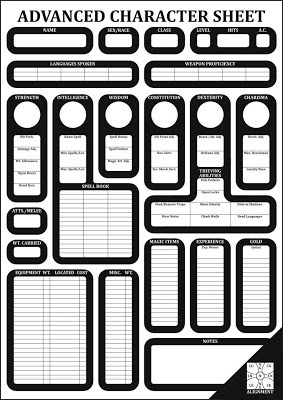 There's just 7 days left to to become a backer of our Character Sheet Pad Kickstarter. We're currently at 80% of the goal, and I can almost smell the black ink as it's being stirred. All we need are another half a dozen backers, and this classic design will be back in print. Here's the version of our fight with added dice rolls. See the previous post for the a mathematically averaged version of the fight. Victory for the PW then as it still has 6HP. The great worm munches down its armour plated lunch and then curls up at the back of its cave to recover its strength. I did two more fast battles and the worm was the winner of both ot those too. In one it was a similar outcome to this one but it was a couple of rounds shorter. In the other the worm poisoned poor Taylor in round 2 and by round 5 Hedun was also slain. The moral of the story is that whatever level you are a purple worm is very bad news. 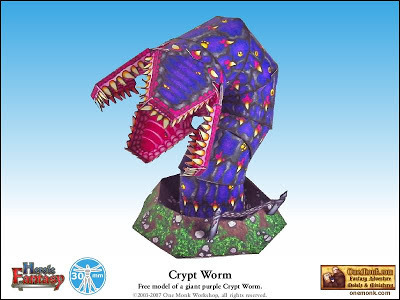 This Crypt Worm is from One Monk Miniatures and is available as a free download. A pair of 14th level fighters enter a large cavern. Before them they see a hungry-looking purple worm, and they charge to attack it. The first fighter, Hedun, takes the mouth end of the worm. The second fighter, Taylor, takes on the tail end. Standard B/X Labyrinth Lord rules apply. Everything has average hit points. Both fighters are AC2 (plate and shield). Both fighters are armed with non-magical long swords (1d8 damage). All hits do average damage (long sword does 4.5). The purple worm doesn't manage to swallow anyone. All combatants attack simultaneously each round. There's no surprise rolls required as all combatants are there's enough distance between the fighters and the worm for them not to change anything in the fight. Purple Worm bites at Hedun. 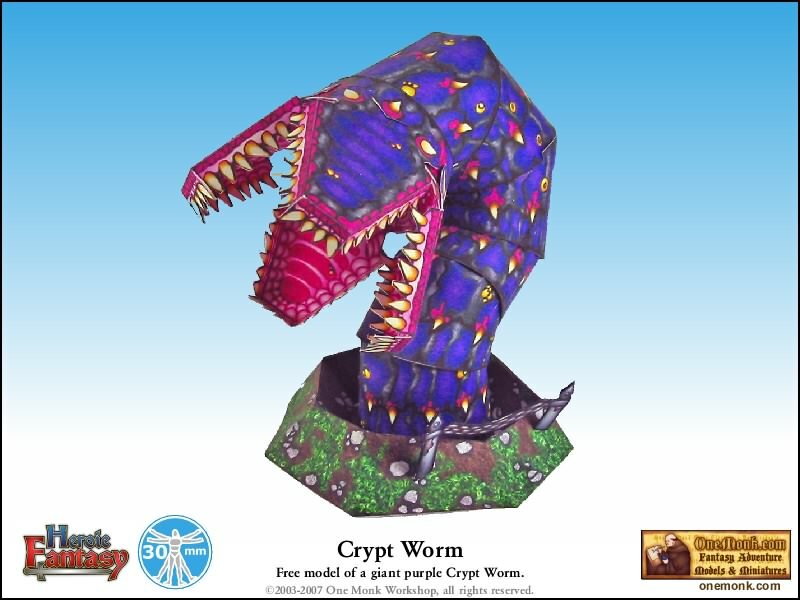 It needs a 7 to hit AC2 which is a 70% chance multiplied by the worm's average bite damage (9) gives 6.3 points of damage. Purple Worm swipes at Taylor with its tail (70% x 4.5) doing 3.15 points of damage. Taylor also have to save vs Poison or die. He needs to roll 4 or higher which equates to a 15% chance of failure. Multiplied by the worm's 70% chance of hitting gives a 10.5% chance of death. This will be cumulative so as soon as it hits 50% that is average point that he could expect to fail a role. Hedun swings his long sword at the worm's maw. He needs a 3 (90% chance) to hit AC6 and his average damage is 4.5 (90% x 4.5) so his actual damage is 4.05 points. Taylor's attack is identical to Hedun's so he also does 4.05 points. At the end of the round remaining HPs are Purple Worm 59.9, Hedun 44.7, Taylor 47.85 and has saved vs Poison. Purple Worm bites at Hedun doing 6.3 points of damage. Purple Worm swipes at Taylor doing 3.15 points of damage. Taylor makes another save vs Poison but his cumulative chance of failure is now 21%. Hedun swings his long sword and does anther 4.05 points of damage. Taylor's attack also does another 4.05 points damage. At the end of the round remaining HPs are Purple Worm 51.8, Hedun 38.4, Taylor 44.7 and has saved vs Poison. Purple Worm swipes at Taylor doing 3.15 points of damage. Taylor makes another save vs Poison but his cumulative chance of failure is now 31.5%. At the end of the round remaining HPs are Purple Worm 43.7, Hedun 32.1, Taylor 41.55 and has saved vs Poison. Purple Worm swipes at Taylor doing 3.15 points of damage. Taylor makes another save vs Poison but his cumulative chance of failure is now 42%. At the end of the round remaining HPs are Purple Worm 35.6, Hedun 32.1, Taylor 38.4 and has saved vs Poison. Purple Worm swipes at Taylor doing 3.15 points of damage. Taylor has to make another save vs Poison but his cumulative chance of failure is now 52.5% which in this battle of averages is where he fails. Taylor's final attack also does another 4.05 points damage. At the end of the round remaining HPs are Purple Worm 27.5, Hedun 25.8, Taylor 35.25 but has failed his save vs Poison and falls to the ground dead. Purple Worm stings Taylor's corpse for good measure. Purple Worm stings Taylor's corpse some more. 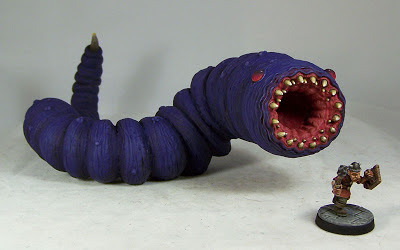 Purple Worm bites at Hedun doing 6.3 points of damage and the fighter drops as he takes his final swing. Hedun swings his long sword for the last time and does anther 4.05 points of damage. Victory for the Purple Worm then, but only just. 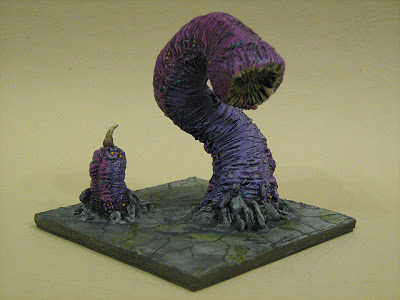 I reckon the fighters would have probably beaten the worm with some basic tactical moves. 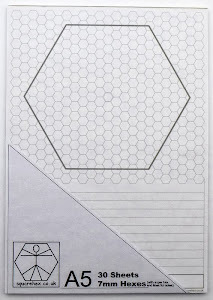 I'll be back after a drink and some supper for a couple of tries at this using dice. I'll reveal the outcome tomorrow. Anybody care to take a stab at who will die and in which rounds of the combat? I've been editing a short article for Oubliette #9 today. It looks at the percentage chance of a character being killed by a venomous creature in the first round of an encounter, before the character has a chance to take any actions. I call this the Pre-strike Poison Percentage. 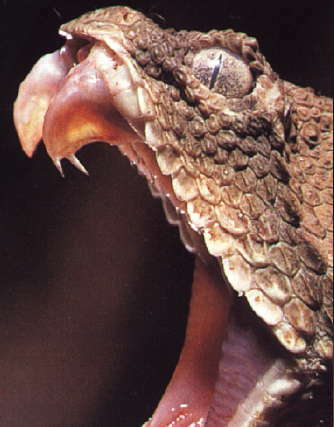 For example, if a 6th level fighter (AC1) opens a door to find an angry pit viper waiting for him, there is an 11% chance that the snake will deliver a poison attack which will prove lethal to the fighter. And that is before the fighter gets a chance to attack, close the door, run away, or take any other action. If we make it a pair of vipers, then the likelihood of death for the fighter doubles. This article for Oubliette is just a bit of fun really, but it serves as a good warning to all players: to take extra care if there's a chance of running into a fight with anything poisonous. Even a 15th level fighter (AC -2) has a 0.5% chance of being killed the instant he encounters a solitary (1-4 hit point) giant bee. In our own Stonehell this means that that as soon as my cleric gets to 7th level, his top priority is to pray for neutralize poison as his solitary 4th level spell. Be careful out there and mind you don't get bitten. I've got a special interest in the Battle of Bosworth field, as I live just a few miles down the road. I like the idea that over 500 years ago, troops were possibly tramping through our garden on the eve of the battle. Based on today's discovery I think there's also a chance that I've parked my car just a few feet above the remains of Richard III. 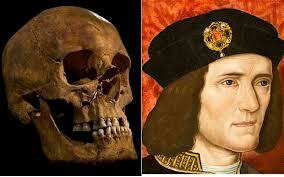 The University of Leicester have this morning confirmed that the remains found buried in Leicester carpark do indeed belong to Richard III. Here's a link to the University's page with details of this extraordinary discovery. Our Advanced Character Sheet Pad campiagn on Kickstarter is just past the halfway point of its 30 day run. It's currently at 74% with just an additional £78 required to reach the goal. I think we can manage this in the two weeks remaining. If we can get £100 extra, then the stretch goal unlocks a free pad of B/X Character Sheets for every backer that signs up for two or more of the primary design.